A little bird sent me a PDF summarizing Keller's 3rd quarter 2006 poll, and I thought I'd share a couple of key slides. 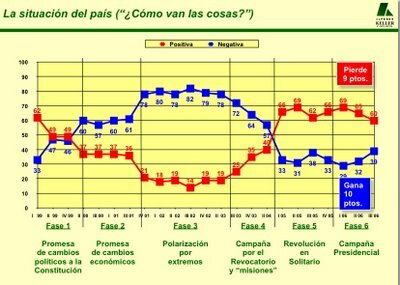 This is that poll whose headline finding was Chavez 50%, Rosales 37% - taken soon after Manuel Rosales established himself as the opposition establishment's single candidate against Chavez in December's presidential election. Annoyingly, there is no Methodology slide, so I don't know what size of towns were polled - only the total sample size (n = 1,000.) All I can say is that Alfredo Keller is a generally professional, reliable public opinion researcher. So, what do we have? First off, that revealing question pollsters love to ask - overall, how are things going in the country? The red line captures positive responses, the blue line negative ones. As you can see, the trend this year is for perceptions to sour: positive responses are down 9 points since the start of the year, and negative answers up 10 points. Still, a solid 60% of respondents gave a positive response, with less than 40% giving a negative answer. That's a tall mountain for an oppo candidate to climb. 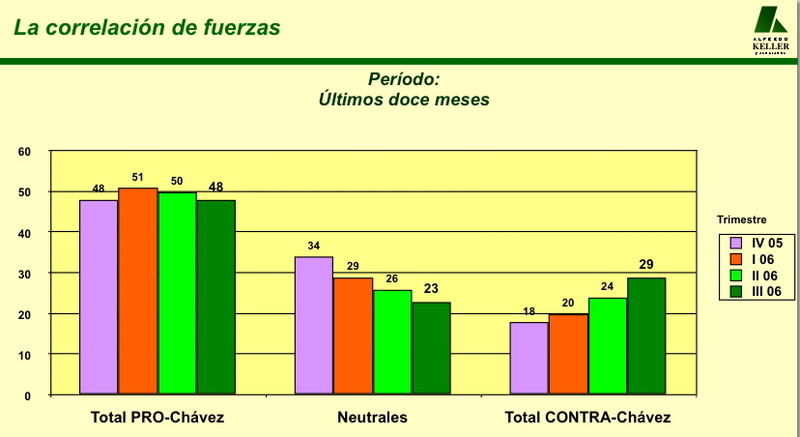 Now, the trend is for "neutrals" to turn against Chavez, while the number of chavistas stays pretty stable. Still, the absolute numbers are fairly daunting. At the start of the campaign - and the fieldwork for this poll was done very soon after Manuel Rosales was annointed Single Oppo Leader - the task facing him was to sweep essentially all the NiNis while retaining his base and winning over at least some chavistas. Basically, he has to clean Chavez out comprehensibly, in the middle of a public-spending led, oil-boom fueled consumption bonanza.